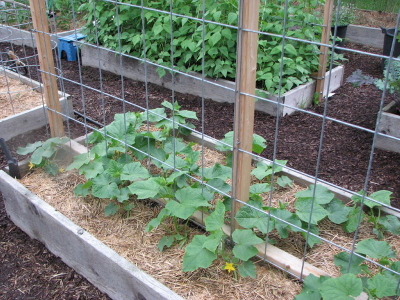 One of our most-read posts is a reader's rebuttal to my square foot gardening lunchtime series. This weekend, Ron sent me a followup detailing the next three years of his gardening trials. I'll let him tell you about the seven-year-old, square-foot garden in his own words. If there is any interest, I would like to add some up-to-date information on my square foot garden and offer some answers to raised questions. On this date, June 29, 2013, I now have 19 square foot garden beds (last reported was 13 - I've added six, 3' x 8' beds). This is so addicting!!! I am now in my seventh year. In the garden area, the grass is now gone (covered by newspaper, cardboard, mulch and woodchips). I found the constant mowing, trimming and pulling of weeds a waste of time and a real pain. The most recent benefit is when the latest storms hit, my soil became a "mosh pit" of clay while the mulched area was well drained and workable. Your readers have a real fascination with my bamboo trellis. It was made from a childhood memory of an old Italian gardener neighbor. Somewhat a testament to him. He truly loved his garden and would always go that extra mile to make things, just right, just so. This memory goes back to the 60's. It took me hours to construct and was based on using 8 foot sections of bamboo, jute twine and a refamiliarization of an old Boy Scout handbook with lessons on "rope lashing." After a couple of hard Upstate New York winters, the jute rotted and had to be constantly maintained. Needing something more beefy and multifunctional, I discovered cattle fencing with wood framing. 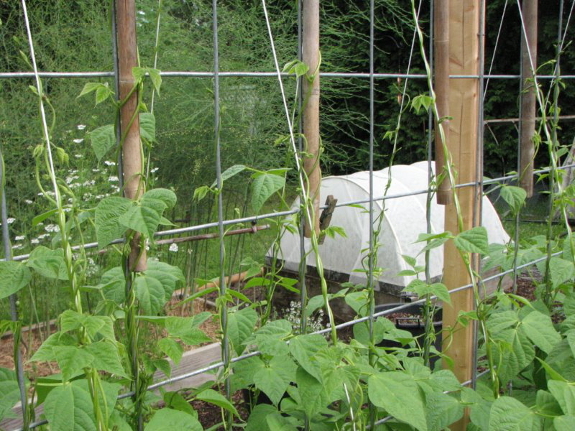 Since my standard beds are 3' x 8', I can simply unbolt my frames from the beds and use elsewhere (crop rotation). 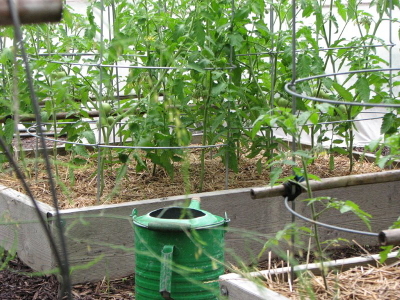 I am also am a user of 24" Texas Tomato cages. With them, in a 4' x 4' bed, I can plant 16 each saladette or cherry tomato plants and not have them tumble over with the weight of hundreds and hundreds of tomatoes. In one 3' x 8' bed, I have 24 cucumber plants started and growing totally vertical. That's one plant per square foot. Yes, the elegant bamboo frame is now gone (not really, taken apart and repurposed). I still enjoy the memory of making it and the images of my old Italian neighbor in his garden who spent the majority of his day there tending it and feeding his family. This year experiments include 3 full 3'x8' beds of fall planted hard neck rocambole garlic. I have added Azomite, kelp meal, and I just started spraying compost tea to this years' crop. Shortly, I hope to obtain rabbit manure, compost it, and then add red wigglers for their castings. All to add to the beds in the fall. It's all about building up the soil. We are now deep into canning, freezing, and dehydrating. This year's garlic scape pesto is beyond belief! As a reminder, I live in suburbia. My neighbors pray to the ChemLawn Gods. "Why grow your own when a grocery store is a half mile away?" So sayeth the neighbors. Frankly, trying to live a sustainable lifestyle up here is a hard sell with this bunch. Wait when they see the chickens in a few years! I believe, loosely, with slight modifications, square foot gardening works and is legitimate method for all experience levels based on their available land, soil conditions and neighborhoods. I will also note and praise, I envy your lifestyle and your more rural conditions. Would also like to add, in addition to the methods used by the Dervaes family, I would also recommend and make mention to your readers to watch the Youtube videos of Laszlo Horvath and GrowingYourGreens. 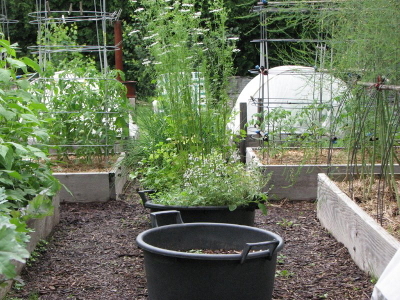 They have taken suburban square foot gardening to new levels and demonstrate its viability. Best wishes from Upstate New York. If you're just getting started with gardening, my Weekend Homesteader ebooks are an easy way to figure out how not to bite off more than you can chew. 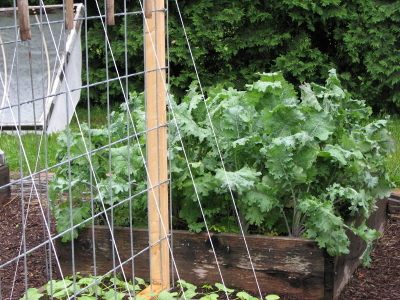 I started with square foot gardening in my front yard and always associate the 1 foot grid with the method. I ditched the grids during the second year because they were hard to work around and would allow slugs to hide underneath. The concept of how much space each plant took was very helpful though. This garden looks great. Thanks for sharing the story.